It’s the most obvious mistake you can make. It can cause embarrassment and reputation damage to your business in equal measure. However it’s one of the easiest things to do and at some point we have all done it! What is it? It’s that most frustrating of all mistakes; the spelling mistake. The Achilles heel that requires constant diligence to avoid (I know this from painful experience). But what is the true cost of making a spelling mistake? Well, that’s difficult to quantify monetarily. There hasn’t been a great deal of research done on it. However, there are examples of costly spelling mistakes all around us. Recently a 1 billion dollar bank robbery was foiled because the hackers misspelt the word “foundation” as “fandation”. Hackers were attempting to transfer the 1 billion dollars (using multiple transfers) out of Bangladesh’s central bank. The spelling mistake caused one of the routing banks, Deutsche bank to query a transaction with the Bangladesh central bank which cancelled it. To put it in context the hackers misspelling of the word foundation cost them 920 million dollars. 92% of the money they could have stolen. They made off with 8% of the money they could have had; a measly 80 million dollars. However amusing this information is; it hardly relates to business. However, there are some case studies that do. Some time back Charles Duncombe claimed in an article that spelling mistakes were costing millions in online sales. Unfortunately, the article was light on research figures that would support this claim. He did, however, cite the example of one website “tightsplease.co.uk”. He measured the revenue per visitor to that website and found that it doubled once a spelling mistake had been corrected. When talking about the damage poor spelling causes on social media we move into the realm of reputation damage; or more precisely credibility damage. A London based digital firm carried out some research on this. 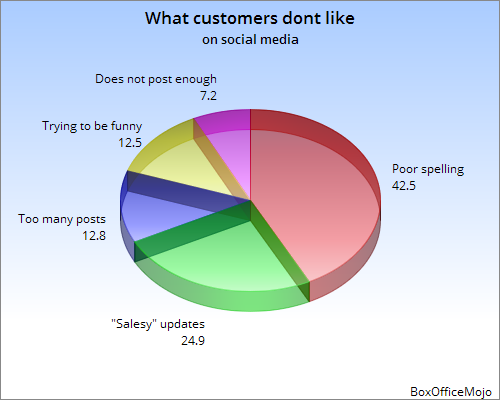 They surveyed 1003 UK consumers and found that 42.5% of them felt poor spelling or grammar was most likely to damage their opinion of a brand on social media. So one simple thing you can do to avoid reputation damage on social media is not make spelling mistakes. You can do this by putting processes in place to prevent it from happening. 1. Use software: Check your social posts before you post them with some software like Grammarly. It is a very handy Firefox plug-in that checks spelling and grammar as you type. You can also upload documents to check. 2. Get someone else to check: It never hurts to have someone else check through your posts before you post them. Two heads are better than one and they will catch errors you have missed. 3. Don’t post your content immediately: Write your social media posts, articles or blog posts check them and then leave them for a day and come back to them with a fresh set of eyes. Then give them a second round of editing before you actually post them. Somehow little things you missed first time round will become easier to see. One final note; if you find any spelling mistakes in this post please leave a comment so everyone who was involved with proofreading and signing off this post can be chastised accordingly.